I had a cake order with a beach theme. After icing it I decided to add some fondant decorations. 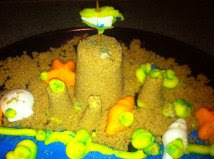 I thought it needed a little something else, so I added a brown sugar sandcastle. It was really fun. I'm thinking someone needs to have a beach wedding theme with a sandcastle as their topper. Amber & Delaney were at youth camp, so Alaina wanted to be in the kitchen with me, so I gave her some icing, a plate, and a bowl of brown sugar. She made a brown sugar castle & added water with people swimming. We both had so much fun playing in the brown sugar. I'm thinking this might be a fun activity for VBS next year.